Home » Melon-choly + 3 recipes! On that note, here are three summer forever recipes. If you make one shopping list this week, put these things on it: 1 cantaloupe, 1 honeydew, 1 lb Persian cucumbers, 6 small or 4 large plums and 3 medium fennel bulbs (stalks and fronds attached). You might take as much liberty with adding more or less of certain ingredients in these recipes because that’s what is best about freestyling in the kitchen. My goal for all of my recipes if for you to change them as much as you can. I think that’s the best way to learn how to cook. I changed this recipe a little bit in my kitchen by pickling shallots and currants. To do this, just lightly sprinkle salt and a little bit of sugar over 1/2 shallot and 1/2 cup of currants. My way to measure this is as much salt as you can pick up with your index finger and thumb give or take a little bit (user discretion!!). Let them sit for 15 minutes and then add them to the vinegar+oil dressing in this recipe. Remove stalks and fronds from fennel bulbs. Reserve 3/4 of the fronds and stalks for the recipe below. 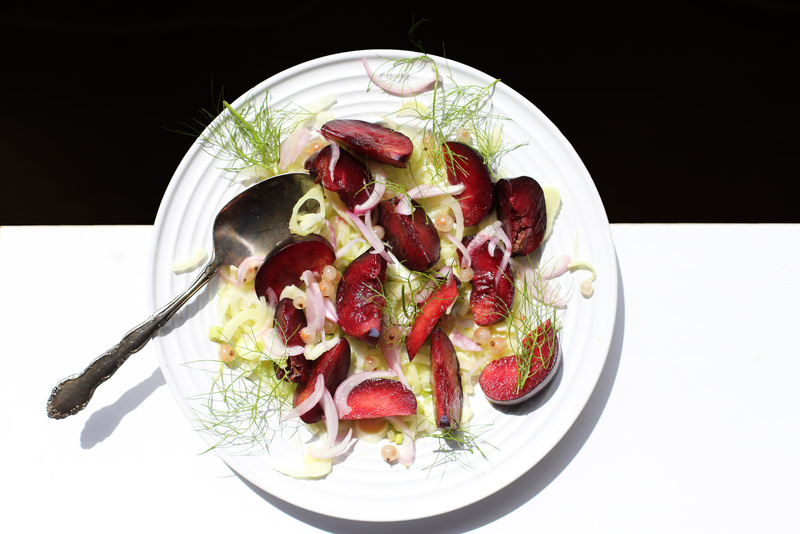 Cut fennel bulbs in half lengthwise and thinly slice on a mandoline; place in a large bowl. Remove fronds from stalks and set aside. Thinly slice the stalks and add to bowl along with plums, vinegar, and olive oil. Season with salt and pepper and toss well. Let salad sit 5 minutes. 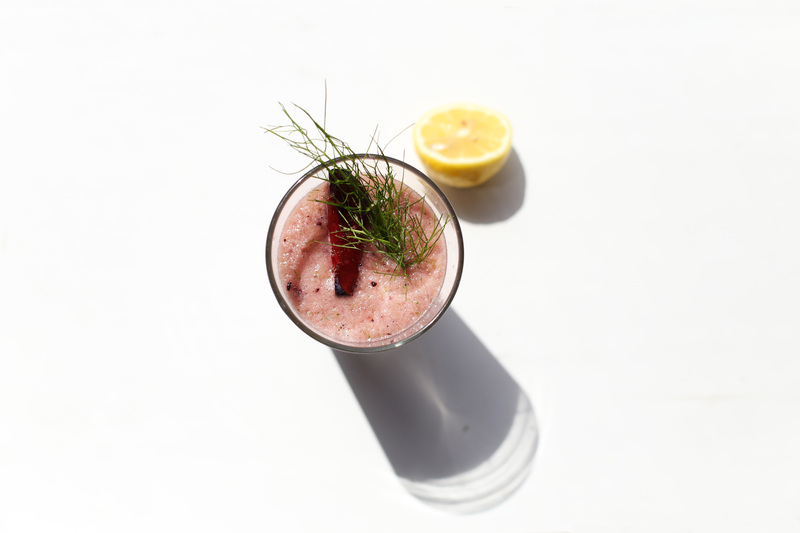 Blend all the ingredients together in a high-speed blender, garnish with fennel fronds and serve chilled over ice. Blend all the ingredients together in a high-speed blender. Pour all the liquid into a 9 x 13 baking dish and place it in the freezer to set. At the 45-minute mark, pull the baking dish out of the freezer and run the tines of a fork through the semi-frozen melon. Put it back in the freezer and repeat the same process until you get a shaved ice-like consistency that’s not too hard and not too soft. 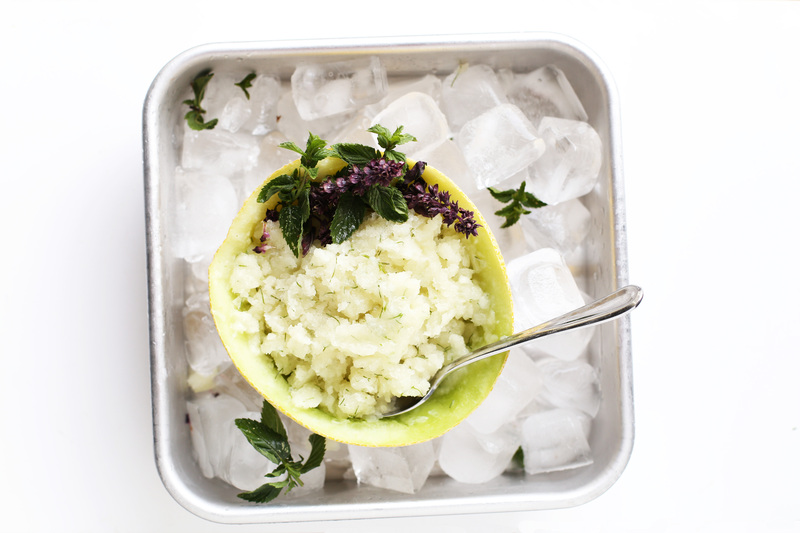 Scoop the granita into a serving bowl and enjoy as much as you desire, chilled. You can make this ahead and store it in a freezer-safe container for up to a week. These recipes sound good – especially for my daughter Christine as she has quite a few restrictions as to what she can and can’t eat – More can’ts than cans! Have a great fall! Thanks Nilda! I definitely thought of her while making it free of dairy! Everything looks yummy. We will see you for summer soon. Then you can make for us. More reason for me to come back here soon so I can practice driving!! Please do visit….it’s quite a lonely place for Matt and me.